Q4 2014 Announcement – Come and Get ‘Em! Q4 is just around the corner and we’re getting our line-up locked down sooner rather than later! Compared to the very silent Q3 you can expect a good range of titles lined up for Q4. We’ll have posts about each one separately showcasing pack shots and more over the next few months but I wanted to start by giving you a bit of an overview from September onwards. We’re waiting on art book approval still so the date is still flexible - but we’re working on something last minute and cool that should make up for the slide. Thanks to fans for their help on QC we can guarantee the discs look amazing too! Notes: Will include the translated 20-page booklet from Japan in addition to rigid collector’s packaging. Notes: Contains the OVA, a 96 page booklet and rigid collector’s packaging. Notes: Standard DVD edition in rigid packaging. Very limited quantity left over from the minimum print run - only available Amazon and All the Anime’s shop! Notes: Contains all the video content as per the Ultimate, a 48 page booklet with the original short story and rigid collector’s packaging. Notes: Contains a 116 page art booklet showcasing the weird and wonderful world of Space Dandy and rigid collector’s packaging. Notes: Theatrical will occur in October & November for the film, both subbed & dubbed. Notes: We’re preparing authoring but can’t commit to anything until the licensor approves our release model. I’ll have a post about the remaining stragglers in our line-up shortly - as there very likely will be additions to this line-up. Great news everyone - this is the first awesome announcement for MCM Glasgow but rest assured we've got more to come on that frontier! 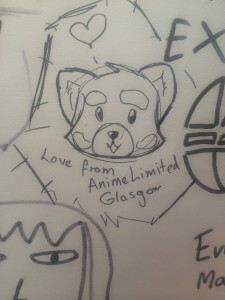 Anime director Shingo Natsume is to be a special guest at MCM Scotland Comic Con when the show returns to Glasgow's SECC this September, event organisers have announced. Currently directing anarchic sci-fi comedy Space Dandy alongside anime legend Shinichiro Watanabe (Cowboy Bebop, Kids On The Slope), Natsume will be attending both days of Comic Con, including presenting an onstage panel on the Saturday of the show. One of anime's rising stars, Natsume made his directorial debut in 2012 with Original Video Animation Hori-san to Miyamura-kun. Other works he has been involved in include Bokurano, The Tatami Galaxy, Gurren Lagann, Fullmetal Alchemist: Brotherhood, Naruto Shippuden and the feature-length Fullmetal Alchemist: The Sacred Star Of Milos. A multi-media pop culture festival covering movies, games, comics, sci-fi, anime, manga and cosplay, MCM Scotland Comic Con is set to be Scotland's biggest ever comic con event. Following a highly successful debut in 2013, this year's show will run over the full weekend. Well, Kat and I have spent the last few days here in Paris going to our very first Japan Expo. And what an Expo to attend - it’s just their 15th anniversary! So maybe it’s like this every year, or maybe this year was a bit more celebratory but there was a definite feeling of good vibes and good times in the air. And we enjoyed every minute of it. 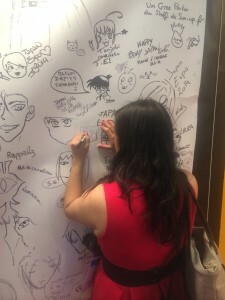 In this the first of our ‘dispatches from Japan Expo’, a series of blog posts written by myself and Kat (our very own crayon scribbler and product manager extraordinaire) detailing our time and adventures here at Expo, I’ll give you a quick overview of what we saw, what we experienced and what we loved about Expo. My feet are killing me, my legs hurt but I have a big smile on my face from all the stuff we were lucky enough to experience. First and foremost, I think it behooves me to point out just how massive Japan Expo is in both actual size and popularity. Many of you will be fully aware of the popularity of the Expo and have heard tales of the size, as had I, but, not unlike seeing a whale in real life for the first time, you just can’t wrap your brain around JUST how big expo is. It’s absolutely mad - with well over 200K visitors passing through its doors. It is massive - and doing a ‘quick reccy’ to see the lay of the land can take all day. There is so much to do, see and take part in that you have to just wonder at it all. The thing that struck me the most was the focus not only on anime, manga and modern Japanese pop culture, but the huge investment in showcasing Japanese traditions, culture, sport and music. Much more so than I’ve seen elsewhere. The tea drinking ceremony demonstration, storytelling, calligraphy, drumming and various traditional Japanese martial arts. More details on what I saw go down along with photos in an upcoming post - there’s just so much to talk about! That being said, there was plenty of modern pop culture to experience. The Kawaii Village was a sight to behold - I may or may not be frightened of cutsie creatures with massive eyes, but I feel like this is neither here nor there. We even sat through a karaoke competition put on by the folks at Moshi Moshi Nippon at said Kawaii Village. Top prize went to a rather glum looking girl, who cheered up rather quickly thanks to winning a trip to Japan. If she hadn’t, well, let’s just say I wouldn’t want a trip to Japan to go to waste…. In a wonderful twist of fate, my first outing to Japan Expo happened to coincide with their 15th birthday - which was nice. They had a lot going on but one thing that I especially enjoyed was the Japan Expo gallery - a space set up quite nicely to take visitors through the history of Japan Expo. It’s set up like a museum display with key moments in the history and timeline displayed and explained. As a visitor wanders through the various sections, picking up on fashion, cosplay and displays you get a real sense of the history of the event. My personal favourite section was the framed and mounted guest drawings from the Expos over the years. A great and rich collection of anime art as you’ll ever get. Beautifully set up and displayed with each drawing given it’s own space to be observed and appreciated. 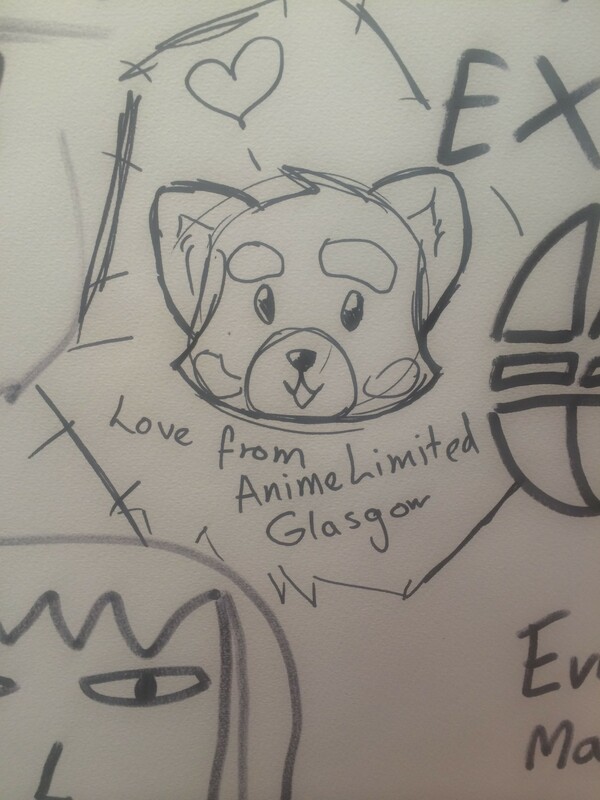 One part I especially thought was a nice touch was a wall dedicated to drawings from visitors celebrating 15 years of Japan Expo. Our very own Kat Hall took to the board (with her own pens of course - she never leaves home without them) to leave our mark on Japan Expo 2014. Well, that about wraps up this quick intro post giving you a brief insight into our weekend. Expect more information, more details and more tales in the coming days. We have ‘pure hunners of photies’ to share with you all. Kat just needs to sort them out first though. We’ll be using some for our posts but will include as many as we feasibly can to a public album for you to peruse at your leisure. 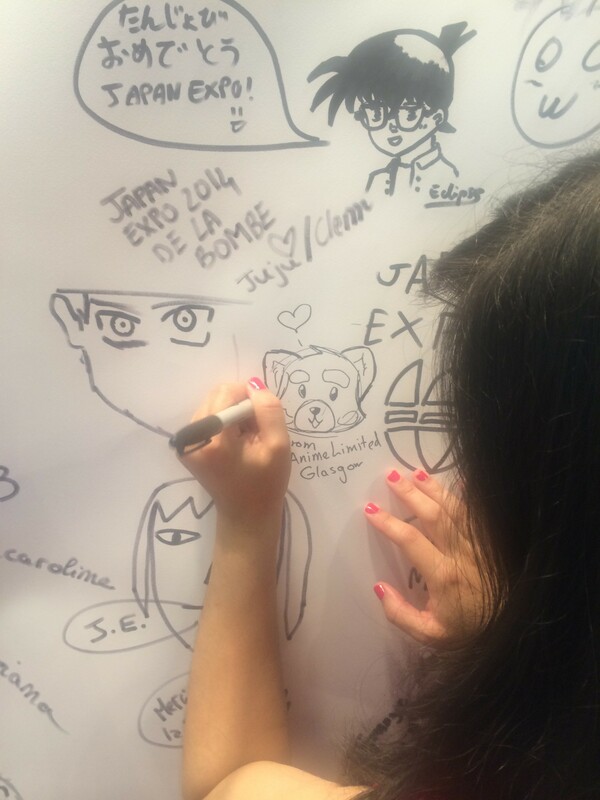 In conclusion, Japan Expo is a riot, well worth a visit, we have tons of photos and we hope you enjoy our posts. Till next time, stay groovy. 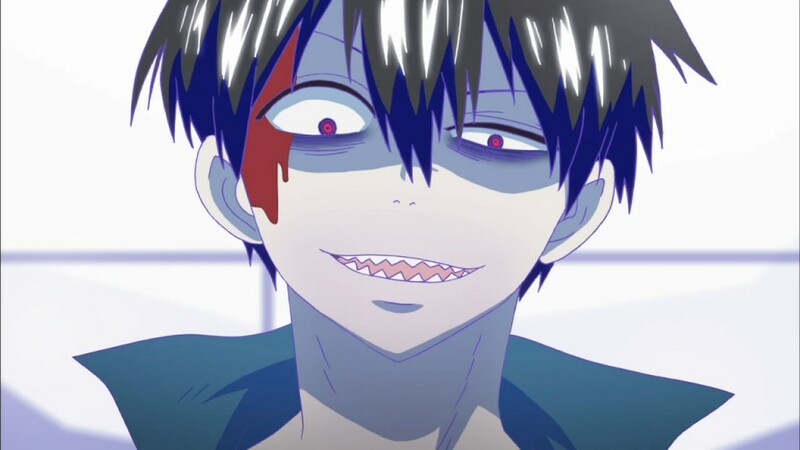 Glasgow, UK May 24th, 2014 - Anime Limited is pleased to announce it's acquisition of the cool television series Blood Lad animated by Brains Base (Bacanno!, Durarara!!) and directed by Shigeyuki Miya (Supernatural: The Animation)! Currently to be scheduled but expected in Collector's Edition packaging at a date dependent on materials. 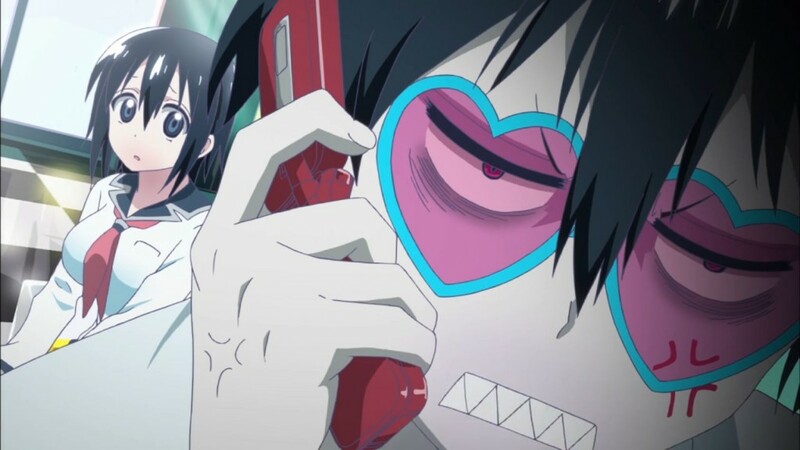 Andrew Partridge, president of Anime Limited says: 'Blood Lad caught our eye as it's a perfect example of how a fighting anime should be! We're looking forward to seeing how fans react to the show too!" Expect pre-orders to go live in in early Q3 across all good retailer.